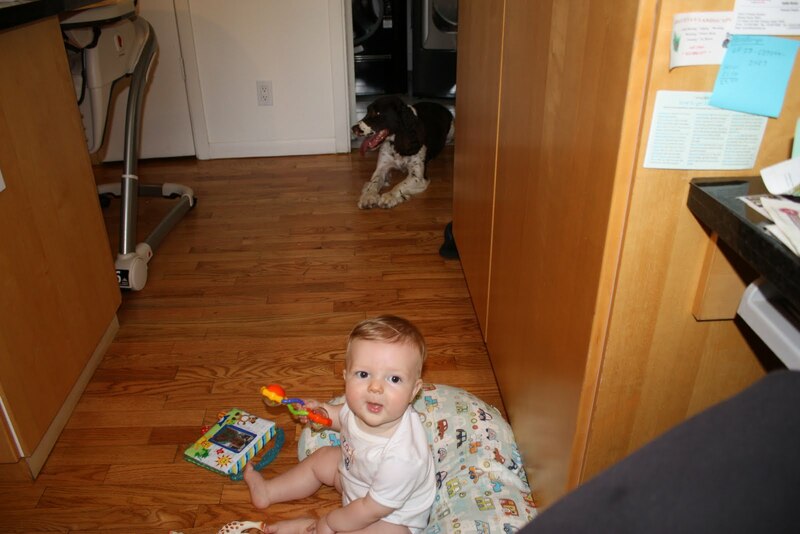 Anyone that knows our dog Norman knows how he is scared of babies. Yes, scared. He is 50 pounds of shaking, barking, and terrified dog around anyone smaller than 5 feet tall. No, he was not an abused dog, adopted from some carny midgets. We brought him home when he was a puppy and no one has ever hit or kicked him. So when Zach came around Alex and I were very, very concerned that Norman would have to go live with his Aunt Lauren, if he and the baby could not get along. I bought 2 books on adding a baby to the family – And Baby Makes Four was the title of one – and a CD of baby noises to get your dog ready for the new addition. What none of the books, internet sites, or Dog Whisperer addressed was how to combat the issue of the sight of a child/baby making your dog scared. They discussed the smell, sound, and toys that come with a baby, but not the actual baby that could make your dog cower in fear. Luckily, Aunt Lauren was there to get us through. She worked with Norman to ignore Zach the first week and progressively he has gotten less fearful of him. For a while he did not love it when Zach was on the floor, but Norman would just lay behind me, his “protector” from the scary baby. So imagine my shock when the other day I was at the computer, Zach was sitting on the floor next to me and Norman lays down not 5 feet from him. Zach was even able to make eye contact! We have come such a long, long way. I should mention that Zachary loooooves Norman. He wants to pet him, grab his ears and watch him wherever he goes.